Over three years after Sierra Leone was declared Ebola-free, people are still reluctant to visit health centers. In a country where maternal mortality is among the highest in the world and children die from malaria and malnutrition, seeking care still means traveling far and paying for expensive drugs and services without any certainty of being cured. To gain people’s trust in the health system, MSF is training local staff, providing medical stock and reaching out to far-flung communities. At 10 in the morning, the health post of Konta, in Gorama Mende chiefdom, in the Kenema district, is slowly filling up with patients. A row of pregnant women wait in the maternity area for a lady in pink, Margaret Toka, the post’s maternal and child health nurse. 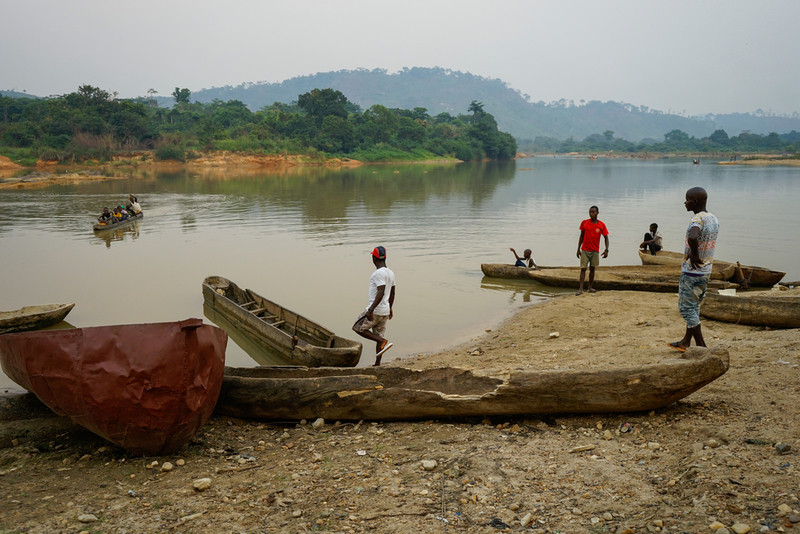 To get to Konta, they have walked for over an hour, crossed the river using a canoe, and walked another half an hour from the cross point to the post. Canoe operators on the Sewa river take turn in ferrying villagers from either sides. One ride costs 2,000 leones, which is a quarter of the average daily income in Sierra Leone. “It’s far but I’m doing it for my baby so I have to do it,” says Bintu Fofannah, the youngest of the group. She says she’s around 18 or 19 years old and on her second pregnancy. 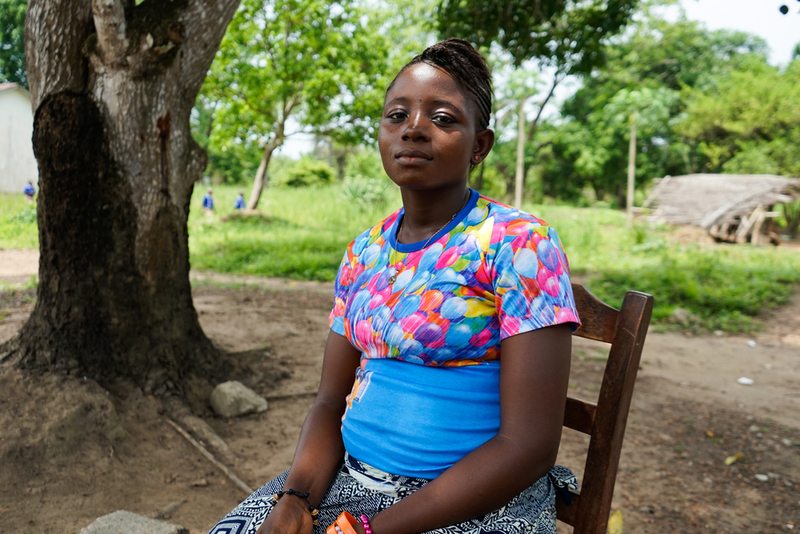 Using rapid diagnostic kits, Margaret will check Bintu’s hemoglobin and blood sugar levels, test her for signs of sexually transmitted infections and conduct the mandatory malaria test. Fofannah waits for her antenatal care checkups. The free care and medicines from the health post motivated her to make the long trip there. Children under five years regularly contract malaria, the top cause of deaths among this age group, and many suffer from severe or acute malnutrition. When Ebola hit the country in 2014 – 2015, Sierra Leone’s already limited health workforce further decreased by 7%. In Kenema district alone, more than 200 health workers died of the disease. 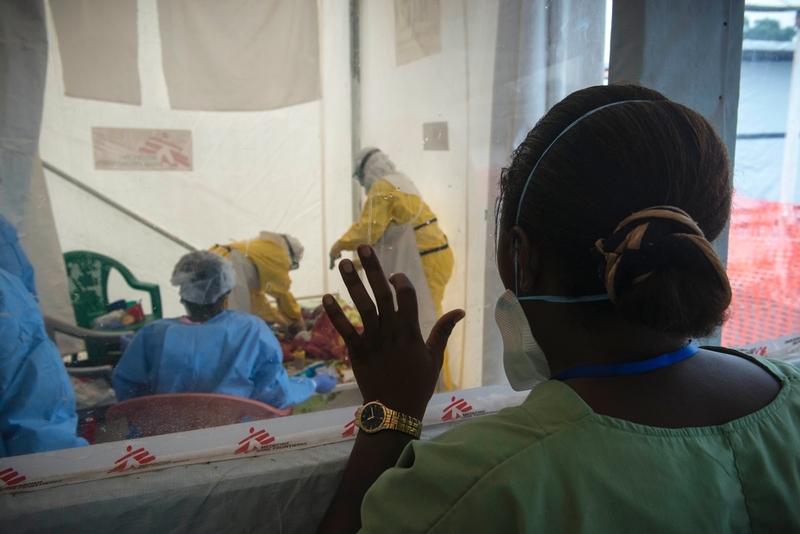 MSF's Ebola Medical Centre in Freetown during the Ebola outbreak in 2015. In blue, an Ebola survivor with light protective cloth provides care for sick children. In rural areas, most peripheral health units (PHUs) became barely functional. They are dilapidated, with no water and electricity and, more often than not, they have no staff or medical stocks. It is then more practical for them to stay in the villages and turn to traditional healers, who would accept gifts such as rice or crops.. in return for their services. Local communities have relied on them for generations. Early detection and referral of complicated cases to health facilities, though, are very difficult when deliveries and treatments are carried out at home, which often results in the death of patients. Since 2017, Médecins Sans Frontières has been working with the Ministry of Health (MoH) to stop women and children from dying of preventable causes. For MSF, this is also a way to build people’s trust in the health system. MSF has also improved the facilities of Baama Community Health Center, which receives complicated cases from the PHUs. 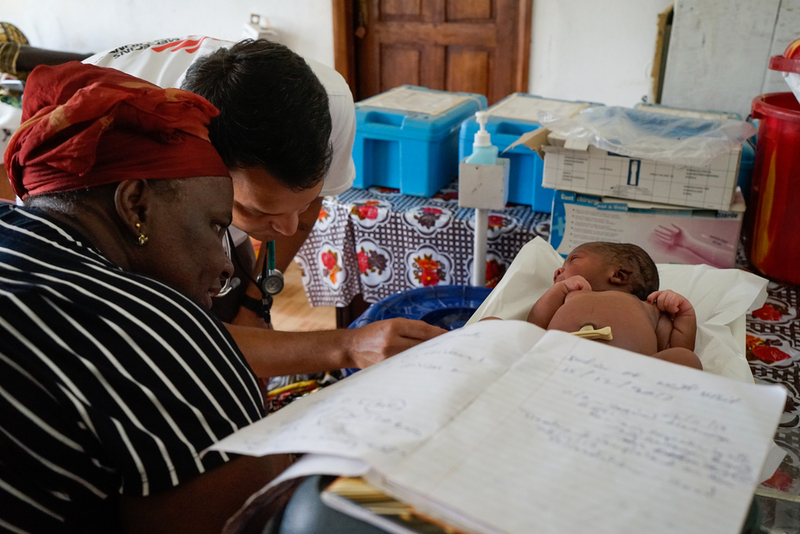 MSF pediatrician, Carlos Lima, and MoH midwife Tene attend to newborns and their mothers at the Baama Community Health Post. An outreach team of MSF nurses and midwives take turn in working alongside MoH staff like Margaret to improve practical skills in diagnosis and treatment. They also learn how to evaluate a patient’s case against the referral criteria, so they build the confidence and medical judgment needed in doing urgent referrals to either Baama or the district’s Kenema Government Hospital. In Baama, an ambulance and a fleet of motorbikes are ready to be deployed each time a pregnant woman or a child under five is in need of a higher level of care. 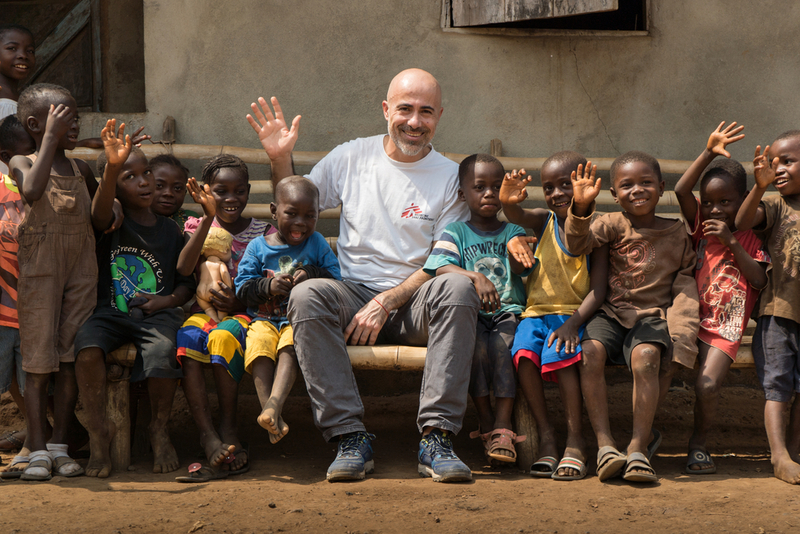 An MSF team at the hospital in Kenema will follow up referred patients, all of whom will be treated for free. A team of health promoters disseminate messages on malaria prevention, good hygiene practices, family planning and teenage pregnancy across the villages served by the PHU. Children outside Robarrie clinic, Tonkolili district. Besides community leaders, health promoters also engage traditional healers and birth attendants in conversations with the communities, acknowledging their role as first responders who can help a faster referral of patients. Near Kenema town, MSF is also building a new emergency pediatrics and obstetrics hospital that will focus on reducing maternal and child mortality while helping to develop the country’s health workforce. Paediatric care services will be provided by MSF hospital from the end of this year through an emergency room, an intensive care unit, an inpatient therapeutic feeding centre (ITFC) and a general paediatric ward and isolation area. The hospital will also have a modern laboratory and a blood bank. A further expansion plan for the structure includes a radiology department as well as training facilities. Training human resources is a crucial step to put Sierra Leone’s health system up to speed. A higher number of skilled health workers will improve the services provided in primary health care structures and allow an effective response to disasters and outbreaks.